Surfing Legend Kelly Slater Finds His Way Into New Upper Deck Sports Card Packs! When it comes to trading cards, baseball has always been king. But things are changing as more and more collectors are looking for a trading card experience that features athletes who make their living off the diamond. Football, hockey, basketball, golf, MMA and even wrestling cards have all been popular, but now Upper Deck is excited to give sports fans a more extreme collecting option with surfing. 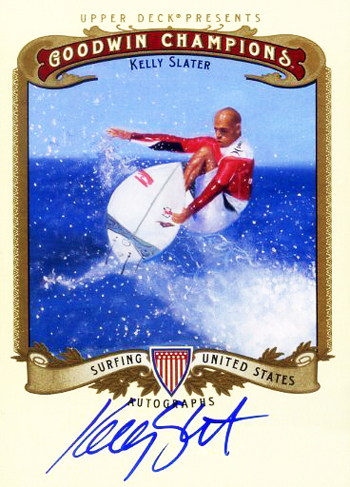 Upper Deck has been targeting pro surfer Kelly Slater for some time and was thrilled when the company was able to strike an agreement for image rights and autographs for new sports cards. One of the key points to striking a deal occurred when Slater learned Upper Deck wanted to include him in the company’s 2012 All-Time Greats product. This release has a checklist of only twenty athletes including iconic superstars like Michael Jordan, Wayne Gretzky, Tiger Woods, LeBron James, Dan Marino, Landon Donovan, Mike Tyson and Pete Rose to name a few. Kelly Slater will now be a part of that impressive checklist of superstars. Kelly adds his authentic autograph to a premium trading card release in 2012 Upper Deck All-Time Greats. Kelly powers right through the writer’s cramp to add his autograph to new Upper Deck trading cards during a recent signing session. The “Shining Through” inserts in 2012 Upper Deck All-Time Greats includes some light f/x foil on the front which gives the card a very shiny look. This super-premium card is actually a booklet that open to show Slater’s killer graph! Slater’s deal is limited which means so are his cards. And with a shorter supply, we will likely see a greater demand from collectors. Fans of surfing’s greatest star can look to find his trading cards in two offerings from Upper Deck this season in 2012 Goodwin Champions and 2012 Upper Deck All-Time Greats. Surf fans can try to score Kelly’s 2012 Goodwin Champion short printed card in the market now! The Goodwin Champions line of cards is currently in the market and Kelly’s autograph cards in the set are selling in the $50-$75 range in the secondary market so there seems to be significant interest in them. It will be interesting to see how a more premium signed trading card of Slater’s sell when 2012 Upper Deck All-Time Greats releases this winter. There are even more rare autograph versions of Kelly’s base card in 2012 Goodwin Champions that have been performing very well thus far. Will Upper Deck add more surfers to the company’s product line up in the future? We’ll have to continue to assess how stoked the grommets, gremmies and locals are when they pull their Kelly Slater Upper Deck cards showing him ripping it up! Hopefully even the kooks like them. Great job from concept to completion, very impressive. The entire Upper Deck Team has represented Kelly Slater in a very favorable way, you should be proud of your efforts- congratulations! this is fantastic news for the surfing world and the trading card business. to put surfing in is about time, because surfing is a legit sport compared to say NASCAR, wrestling, UFC, etc. even golf. no really golf is a sport, i’ve played golf and it’s a tough sport to play and i also surf. i’ve been surfing for over 35 yrs and still surf at the age of 51. it’s definitely one of the toughest sports i’ve learned to do and also one of the most rewarding. i played soccer in middle school for one year and high school for the entire 3 yrs as a starter. then after i got my driver’s liscense it was surfing over soccer by far even though i lived inland, 1 hr away from the beach. 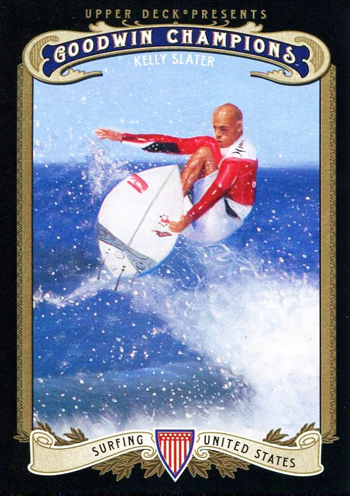 but, back to kelly slater being the first surfer on an upper deck card it’s quite fitting, being kelly’s been champ for 11 yrs. also, has changed how surfing is looked at, from the vision of a surfer being a beer drinking, marijuana smoking beach bum to a serious competive minded clean living, healthy life style athlete. cheers to upper deck sports card and kelly slater for making this happen. from the no wave capital of the world cocoa beach, florida, now 11x champ, surfboard in the smithsonian institue and going for number 12. kelly slater, who by the way i’ve surfed with at sebastian inlet and knew then that he was destined for greatness. 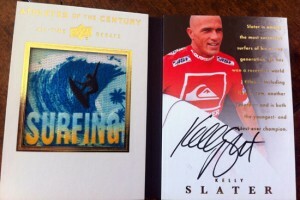 kelly slater had a dream and made it happen through hard work, clean living and a real competive nature about himself. kelly slater is truly an ambassador to the sport of surfing and an example to any athlete what it takes to achieve any goal you set your mind to. again, cheers to kelly slater from litttle cocoa beach, florida, a tight family and hard work, shaka brah, great job kelly slater, peace, hawk!!! Hello. I really wanna have a signed card of Slater. Ill pay what it costs 4 sure! How do I get a hold of one? Mail me back if you got any info or even a card for sale. hologram series? Wave action Showing Dane going airbourne @ pinners? Rights on Kelly! and Upper Decklers! Vegas? Carlsbad? Pierpont? anyone? anyone? Buehler? Buehler?